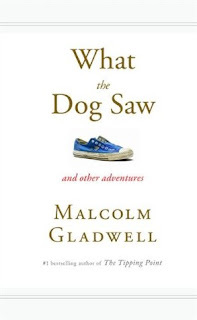 I'm a Malcolm Gladwell fanboy. I love how he starts to tell a story and then approaches the same story from a totally different angle. What do mammographies and looking for biological weapons on satelite images have to do with each other for example. His lastest book, What the Dog Saw is a collection of interesting articles he wrote for The New Yorker. Most of the stories offer you a view into an unknown world. I picked two stories that I really liked, both marketing related: one about marketing research and the other about copywriting. A story about why it isn't enough to make the best ketchup in order to beat Heinz. Howard Moskowitz, a famous food-testing and market-researcher, knows why. One of his first clients, Pepsi, wanted to find out the right amount of sweetener for their new Diet Pepsi. Previous research showed that anything below eight percent of sweetener wasn't sweet enough and anything above twelve percent too sweet. Moskowitz went out and created cola samples of all the different values lying in between eight and twelve. After the test results came back, the data were inconclusive. Preferences did not lean towards one percentage of sweetener. He then realized that there was no perfect Diet Pepsi, there were perfect Diet Pepsis. In 1986 Campbell's Soup Company wanted something new for their spaghetti sauce. Their product, Prego, was thicker with diced tomatoes and stuck better to the pasta than the sauce of their competitor, Ragú. But it wasn't selling. Instead of modifying the sauce like in the Pepsi case, Moskowitz assumed people didn't know what kind of sauce they wanted until it was in front of them. He came up with 45 varieties of sauces. Each with different characteristics such as: spiciness, sweetness, saltiness, thickness, aroma, cost of ingredients, and so forth. These samples were tested by consumers and rated on a hundred-point scale. Results again seemed all over the place but a pattern emerged. Instead of one perfect sauce, consumers could be grouped in three big groups, each with their own favorite sauce: plain, spicy, or extra-chunky. Competitor Prego didn't have this last variety and it turned out to be very successful. Today a lot of products are available in millions of varieties. This story shows in part how we got to this large number. People are different and want different things. It also illustrates the importance of knowing who your customer is. Instead of a one perfect product for everyone, going into that niche might be a good idea! A story about advertising and knowing what women really want. "Does she or doesn't she. Only her hairdresser knows for sure." To get away from the prejudice that all fake blondes were chorus girls or hookers, their campaign recruited girl next door beauties instead of the stars of the time. Specht took the emancipation further, it was about the woman itself. You can read the full story here(pdf). But there are plenty of other cool stories in the book, go check it out! No time to read books? The archives on Malcolm Gladwell's personal site are also worth it!